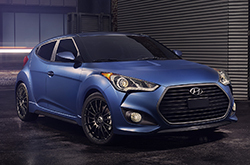 Dallas-area buyers will fall in love with the updated 2016 Hyundai Veloster in Arlington. Rolling out in 2016 with upgraded technology, revised styling and performance enhancements, the all-new Veloster is a contemporary option meant for drivers seeking efficiency, convenience and agility at an affordable value. Whether you desire the sleekness of a coupe, the spaciousness of a sedan or the convenience of a hatchback, you are sure to find the perfect blend in this year's Veloster. A major addition to the Veloster comes in the form of an all-new Rally Edition. Created as an extension of the R-Spec Model, the Rally Edition showcases a matte blue exterior complemented by lightweight wheels, performance-based suspension, carbon-fiber-look aero accents and unique badges. This performance based model joins the lineup alongside the base Veloster, the Veloster Turbo and the Veloster Turbo R-Spec to create a truly well-rounded lineup. Other changes this year come in the form of revised styling and technology. On the outside, the new Veloster offers a revised hood appearance, a dark gray grille surround and wider tires to complement the sleek hatchback's appearance. Carrying over from the last year, a hidden door appears behind the passenger door to allow easy entry for 2nd row passengers. Our 2016 Hyundai Veloster review's favorite aspect of the car, this door eliminates the uncomfortable and often awkward process of trying to climb into the back seat, while still maintaining the polished coupe appearance buyers seek. Inside, the Veloster flaunts a 7-inch touchscreen updated with HD Radio capability, SiriusXM connectivity and available next-generation Blue Link telematic software. 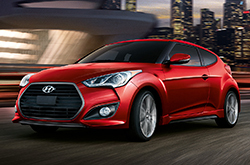 Powering the 2016 Hyundai Veloster in Arlington is a 1.6L four-cylinder engine that uses direct injection technology to deliver a peak output of 132 horsepower. Combined with an all-new six-speed EcoShift dual-clutch transmission or a manual six-speed, the Veloster offers a combined EPA-estimated fuel rating of 31 or 30 mpg respectively. Both the Turbo and the Turbo R-Spec models utilize a 1.6L turbocharged engine rated at 201 horsepower and 195 lb.-ft. of torque. Well stocked with features and ready to perform, the Veloster is an excellent choice for contemporary car buyers seeking style, performance and extra convenience. Want to see for yourself? Test drive one of our outstanding models near Dallas today after checking out the rest of our 2016 Hyundai Veloster review below. What are you waiting for? Find your Veloster now! Compare Hyundai's newest model of the Veloster to its rivals and we're certain that you'll choose it over vehicles like the 2016 Volkswagen Golf, Volkswagen Scirocco, Ford Focus and the Mini Cooper S. If the Veloster's useful onboard technologies and superb exterior design don't convince you that it's the ideal vehicle for you, we're sure its affordable MSRP will. Many drivers in Arlington choose it because it's a fantastic value; compare its price to the opposition to see for yourself. 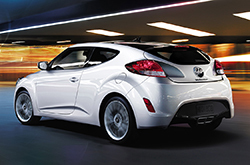 Get more details - Catch a glimpse of our Veloster Quick List below this text! Welcome to the Vandergriff Hyunadi review of the new Veloster. After reading our overview above, if you decide the Veloster isn't the ideal vehicle for your budget, please check out other 2016 Hyundai reviews in our research gallery. As the foremost Hyundai dealership in Arlington it is our duty to present our customers with reviews drafted by the most outstanding Hyundai writers around. Crammed with precise information and specs, each article gives you complete details about all the Veloster has to offer Arlington drivers in terms of fuel economy and much more. Discover more about Vandergriff Hyunadi's attractive lineup! 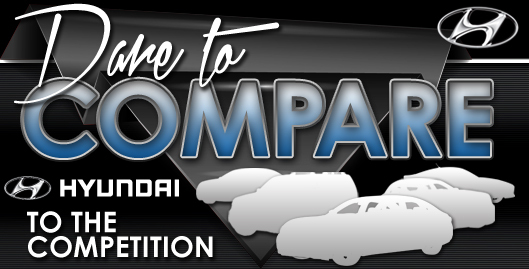 Review and compare Hyundais other vehicles in our digital research archive now!